A 20-year old medical student from Haryana, India has walked away with the Miss World 2017 crown, 17 years after Bollywood star Priyanka Chopra took the title in 2000. 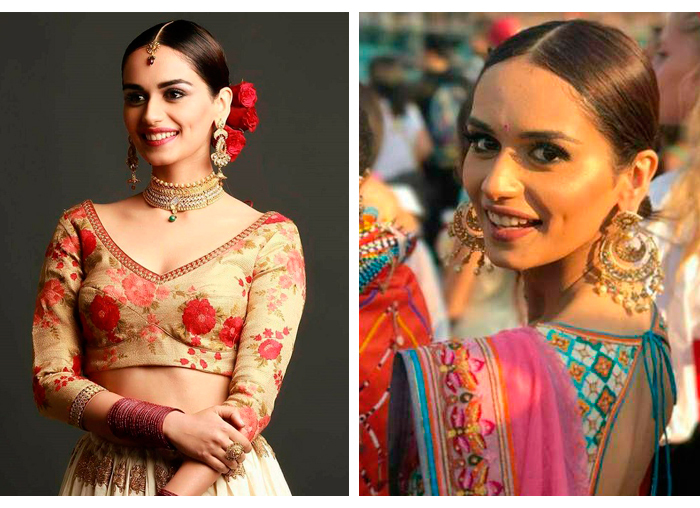 Manushi Chhillar won the annual beauty pageant, held in Sanya, China this year, ahead of Miss Mexico (1st runner up) and Miss England (2nd). One of her answers, that mothers should be paid the highest salary, has sparked debates around the world on the lack of recognition and societal contribution women make when they stay at home to raise their children. Hailing from sunny Goa, Reita made India proud on the international stage after becoming the very first Asian woman to take the accolade. She later went on to qualify as a doctor and moved to Dublin to start her practice. After architecture student Aishwarya won Miss World, her career turned to modeling and acting in Bollywood and international films. Three years after winning Miss World, Aishwarya met her husband, Abhishek Bachchan. 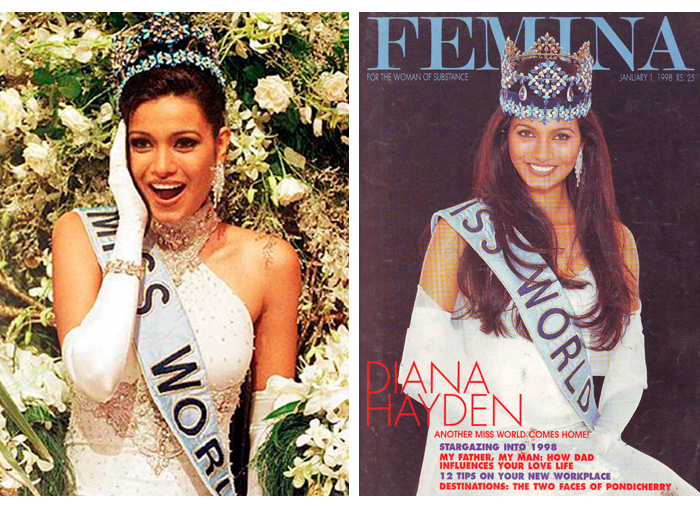 Three years after Aish, drama student Diana continued to show the world that Indian women are the world’s most beautiful. With a degree in computer sciences and trained in Indian classical music, Yukta Mookhey proved she was blessed with brains as well as beauty. The Bangalore-beauty was offered B-town movie roles but chose instead to direct her efforts on politics and social work. Listed as one of the World’s 100 Most Powerful Women in 2017, Priyanka has achieved a lot since she was crowned Miss World at the tender age of 17. She received her crown from fellow countrywoman Yukta Mookhey who won the year before. 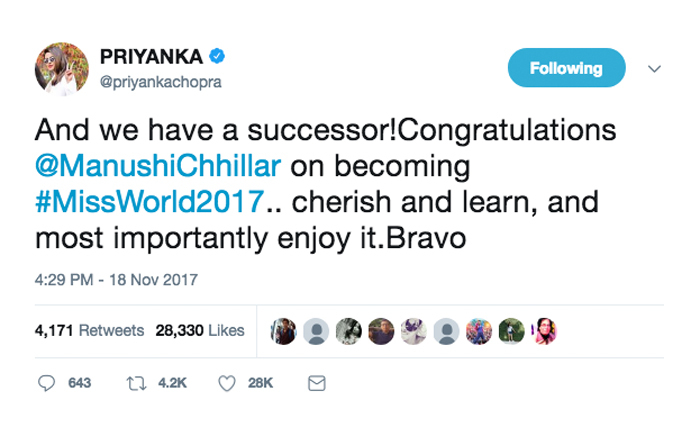 Despite her busy diary as the toast of Hollywood and Bollywood, Priyanka took the time to congratulate Manushi on her triumph. Well done Manushi, you’re doing Indians around the world proud! We can’t wait to see what you do next.